Did you know some humans have the ability to see 7,000,000 colors? Even though contrasting shades of similar colors are not always evident, artist use millions of colors to create intriguing works of art. Unfortunately, hundreds of millions of people are colorblind. This post explores how color vision affects our ability to appreciate and experience art. While black and white photographs can be captivating and intricate sketch work is magnificent, it must be said that color adds brilliance to a piece. It draws out emotion and stitches together a scene. Also, color allows an artist to add depth to their work and evokes emotions in those who view it. Color vision is the way an eye or machine (like a camera) interprets the wavelengths or frequencies of light on an object. Therefore, all colors exists because of light. To explore how color affects the art connoisseur (and all normal-functioning eyes for that matter), WebExhibits set up virtual display depicting the relationship between human perception of color and colors used in art. It is called, “Color Vision and Art.” The exhibit guides you through the inner workings of color. This website (http://www.webexhibits.org/colorart/) is full of interactive elements as well as interesting facts about color. Can you imagine a world without color? 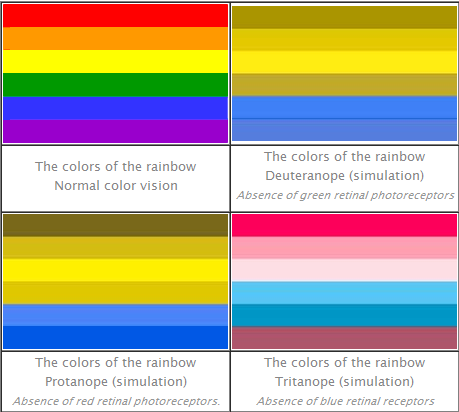 Colorblindness is the condition that makes it hard to differentiate and distinguish colors. This condition is often passed on genetically and present at birth. Unfortunately, the cause of colorblindness, absence of a color-sensitive pigment in the cone cells of the retina, is common. According to WebExhibits, 1 in 12 men and 1 in 200 women are colorblind. There are 3 different types of colorblindness that affect one’s vision. The Color Matters website (http://www.colormatters.com/color-and-vision/what-is-color-blindness) illustrates what people see in each circumstance. Just because an individual cannot see color does not mean he or she can’t appreciate art. In fact, there are many artists who suffer from colorblindness. On http://www.colourblindawareness.org/, it mentions that there is speculation over whether or not famous artists Constable and Picasso were colorblind. Although, many people with colorblindness avoid studying or pursuing careers in visual arts. Aside from that, people of different color vision capacities still enjoy creating art. While the fullness color brings to a painting, photo, or any other masterpiece cannot be experienced, individuals still enjoy the act of creating and viewing art. This brings up the question, how important is color vision to art? Do you agree with Andrew Loomi? Or does art have purpose rooted beneath surface color? This entry was posted in Art, Color Vision, colors, Segmation, The Art of Color and tagged appreciate art, artist use colors, color vision, color vision and art, color vision effects art appreciation, colorblind, colorblind people enjoy art, colorblindness, creating art, facts about color, importance of color vision, people are colorblind, the art connoisseur, WebExhibits on November 30, 2011 by segmation.